The U.S. Consulate in Nogales, Mexico sponsored this bi-national art exhibition at the Museo de Arte de Nogales. Building Bridges Across Nations is such an important concept, especially here in the borderlands. My art piece selected for the exhibit is called “Nuestra Raices” and it reflects the importance of my Mexican ancestral roots in order to continually thrive and nurture my life as a Chicana artist and U.S. Citizen. This exhibit was so much more to me that just a showing of my art. Building Bridges across our two nations is also something very personal to me. My father, a Mexican citizen immigrated to the U.S as a teen, but lost his citizenship when I was 9 years old. That being said, he has NEVER seen any of my artworks or attended any of my art openings, being unable to come back to the U.S. 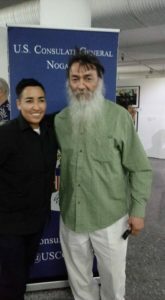 This show at the MUAC in Nogales gave me the opportunity to invite my father from Baja California, Mexico to come and see my art and experience my life as an artist. An unbelievable art opening, to meet so many talented Mexican & U.S. artists and see their thought provoking art of reflected of the Borderlands. But best of all, to invite my father into my world of art for the first time in 30 years. Thank you Mr. Consulate & Museum of Contemporary Art Nogales!